Viviana came to me for a website redesign through a referral from another Veterinarian. 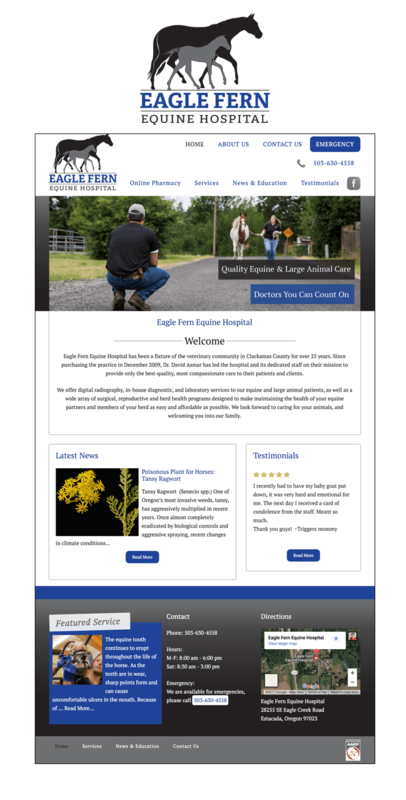 I was excited to work with horse vet and drove all the way out to Estacada to meet with her. She took me on a tour of their amazing facility and I got to walk right by the horses that were there for appointments. She asked if I was afraid of horses, to which I answered “no”, but I have to admit, I was a little intimidated walking by them! Their old site was dated and dark and wasn’t representing them well. She hired a professional photographer (which I highly recommend) and the images helped make my job easy! We reworked their logo and colors and we were all very happy with the finished product!